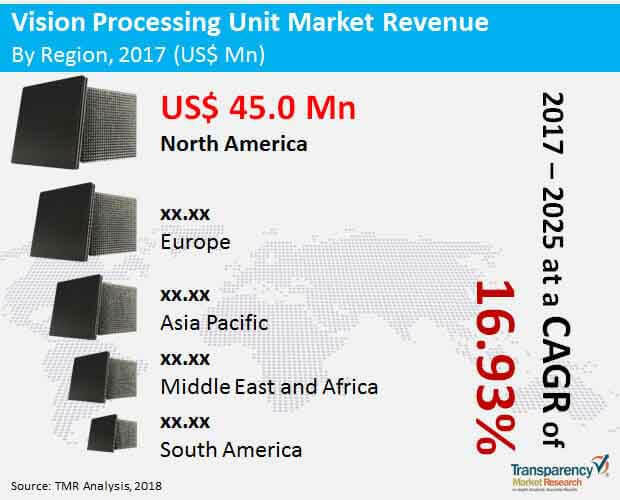 According to a new market report published by Transparency Market Research entitled “Vision Processing Unit Market – Global Industry Analysis, Size, Share, Growth, Trends and Forecast, 2017 - 2025”, the global Vision Processing Unit market was valued at US$ 148.9 Mn in 2016 and is expected to expand at a CAGR of 16.93% from 2017 to 2025, reaching US$ 605.4 Mn by the end of the forecast period. The Vision Processing Unit (VPU) market is primarily driven by the increasing adoption of machine vision systems across wide range of industry verticals including consumer electronics, automotive, healthcare, and manufacturing among others. Various robots having vision capabilities are increasingly being implemented across the manufacturing and automobile industries for various purposes which include inspection of the products, quality check, assisting in the various stages of production, and security and surveillance among others. Furthermore, the growing developments in the automobiles particularly, the autonomous vehicles is anticipated to impact the market positively. Machine Vision systems are used in the automobiles as a part of advanced driver assistance system (ADAS) which leads to improved safety while travelling. Additionally, the advent of Artificial Intelligence (AI) and machine learning technologies required to program the systems is expected to assist the growth of the market. The implementation of vision processing units across all the above mentioned applications will result in high quality of images and ensure the better performance of the system. Vision processing units also are increasingly being used in smartphones for giving an exceptional photography experience to the user. The use of VPU in smartphones results in low consumption of power and increased battery life. VPUs are also used in wearable cameras which are used by adventure enthusiast, police personnel and security forces for surveillance, and in medical fields by the doctor to document the medical procedures being performed on the patient. Thus, the growing demand for low power consumption system on chip (SoC) circuits which find varied applications is expected to propel the growth of the market. However, the complexity associated with the programming of the system on which VPU is incorporated is likely to be a limiting factor for the market growth in the coming years. Nonetheless, Vision Processing Unit market is expected to witness several innovative and technologically advanced products in the coming years. The key trends prevalent in the Vision Processing Unit market are the strategic alliances of established as well as small players with their peers in the semiconductor segment in order to establish footprint in the vision processing and machine vision space and gain greater share globally. Many developments are taking place in the automobile industry for making the automobiles smarter which will drive the growth of Vision Processing Unit market. Also, major players in the electronics space are working for the innovation and development of technologically advanced products for better efficiency, operation and reliability of the systems in which they are implemented. Depending on application, the global VPU market has been segmented into smartphones, digital cameras, automobiles, wearable devices, drones, robots, and medical devices. In 2016, the smartphone segment was the highest revenue generating segment. Vision processing units are increasingly being used in smartphones to improve their photography capabilities and increase the functionality of the cameras which is fuelling the growth of the market. The autonomous vehicles segment is estimated to grow at a fastest CAGR of 17.51 % over the forecast period from 2017 to 2025. Based on the end use verticals, the market has been divided into consumer electronics, automotive, industrial, and healthcare and others. In 2016, the consumer electronics segment was the topmost revenue generating segment owing to the increased implementation of VPUs in electronic devices such as smartphones, wearable devices, digital cameras, drones where low power consumption is a primary concern. Furthermore, the automotive segment is expected to witness a fastest growth among all the other segments owing to the large scale adoption of electronics in the automobiles for infotainment, driver assistance systems, and the extensive developments taking place in autonomous vehicles. The automotive segment is expected to grow at CAGR of 17.49 % over the forecast period from 2017 to 2025. In terms of global geography, the market has been divided into North America, Europe, Asia Pacific, Middle East & Africa and South America. In 2016, North America was the topmost revenue generating region followed by Europe. Asia Pacific region is expected to grow at highest CAGR from 2017 to 2025 owing to the bolstering growth in the automotive and electronics industry. Asia Pacific region is expected to grow at a CAGR of 19.08% over the forecast period. Key players in the market focusing on the introduction and development of new products into the market to gain a competitive edge and improve its brand positioning in the vision processing unit market. The key players profiled in the global Vision Processing Unit market include Movidius, Inc., Synopsys, Inc., MediaTek, Inc., Imagination technologies Limited, Lattice Semiconductors, NXP semiconductors, Active Silicon, Cadence Design Systems, Inc., Ceva Inc., VeriSilicon Ltd among others.